I found this set of drawers via @LyndsieRoss on Twitter. Wow! The first thing that popped into my head was, "This would be great for kids!" Look at all the shapes and textures their little hands could explore. Then I thought, "What would you put in that?" which is a question Lost Boy asks me whenever I want to buy a cool box or organizing gadget. I would put things that start with the letter L in the L drawer. Like a lollipop, a lozenge, a lock, a lady (a miniature doll or toy), a lime (for a day or two), a lid and anything else that my kids could find that started with L (and fit in the drawer). What would you put in this set of drawers? 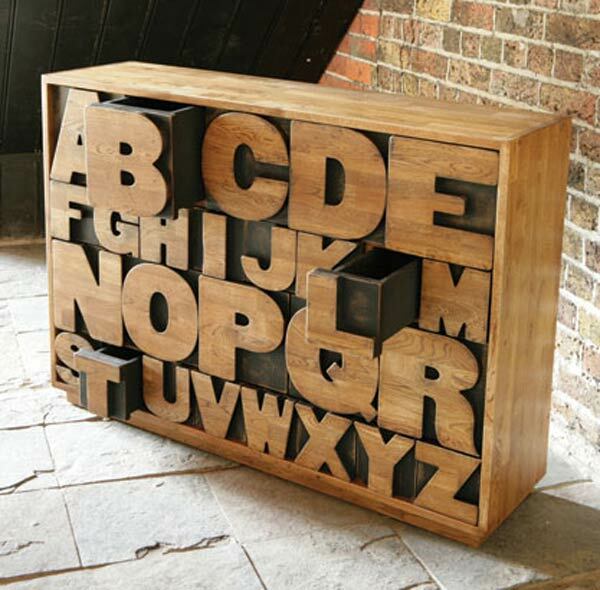 This set of drawers is super expensive: £2700. That is $4429 (I did the conversion on Wolfram|Alpha). Um. Whoa! Maybe someday I'll make my own set (when I have kids) and just stamp or paint the letters on the front or something. How would you do it? I would put something pink in the P drawer, a toothbrush in the T drawer, a shoe in the S drawer, a book in the B drawer...this is fun:) its like Mom's little letter baskets in the preschool only cooler because the drawers are bigger so you can have bigger objects!! I love it! Too bad it's so expensive!